While the tourists all know about Napa and Sonoma, the locals all go to Healdsburg. It’s a charming, small town with fantastic restaurants and tasting rooms scattered about the town square. It also is the home to one of our favorite cafes, Flying Goat, and one of the friendliest running stores in the nation: Healdsburg Running Company. This is just a charming, flat place to explore, with great weather most of the year. Raise a glass to Healdsburg, the perfect place for a teambuilding scavenger hunt! Event Description: An appealing, “bucolic” site for a corporate team building event, downtown Healdsburg is an upscale neighborhood with restaurants, boutiques, and coffee shops galore. Walk 2 blocks away from the town square, however, and the scene shifts to stately Victorians and tree-lined boulevards, b&b’s, and more wine-tasting rooms than you can shake a bottle of Merlot at. Location History: Once the home of the Native American Pomo people, Healdsburg received its modern name from Harmon Heald, who bought the land in 1857 after squatting here for 7 years previous. Farming was common within Healdsburg between the 1890’s and 1940s before the town began gentrifying and “wine-ifying”. 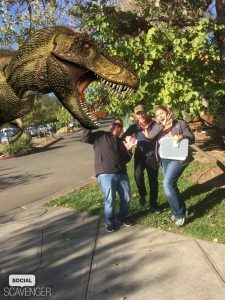 During your corporate team building treasure hunt… expect to see a mural of old Healdsburg, the quaint town museum, a futuristic statue, the old town square, and much, much more. Gather at your hotel/conference room, or in the leafy town square.